Green Springs is located in historic downtown Seneca South Carolina at 114 Ram Cat Alley. We are a locally owned and quirky independent gift boutique focused on American made & Fair Trade fun. We carry over 70 American-made product lines! "MADE IN THE USA" is not rare at Green Springs! Interested in pottery? 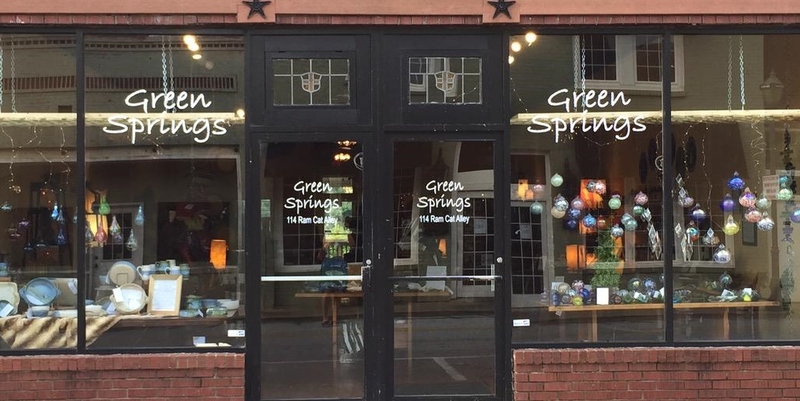 Green Springs carries the work of 18 American potters! Like glass? We carry the work of 7 American glass artists! We also have American made toys, baskets, candles, totes, soaps, even nightlights! Interested in Fair Trade? We are too. We carry many items made under the tenants of Fair Trade--baskets, lamps, purses, jewelry, toys and more. What is Fair Trade? In short, it is when the crafter is paid a fair wage in fair conditions with efforts at sustainability. In long, read more here. Ram Cat Alley is a fun and vibrant street full of fun shops and great restaurants. We are minutes from beautiful Lake Keowee, Lake Hartwell and Lake Jocassee. Come play in the lakes and visit Ram Cat Alley, Seneca South Carolina! For more information, please check out these webpages: about Ram Cat Alley or Historic Downtown Seneca!